When the relics of the chains that held St Peter were brought to Spoleto in Italy in about 419 AD, Bishop Achilleo built a church to house them. So San Pietro extra moenia, Saint Peter’s outside the city walls, was built on a necropolis that was used to as a burial ground for the Bishops of Spoleto. In the Late 12th and early 13th century after battles between the rival factions the Guelphs and the Ghibellines had damaged the original church the church, San Pietro was rebuilt in the Romanesque style of the period. The facade of San Pietro was decorated with Romanesque Bas relief sculptures created by a single workshop of sculptors. The facade is a grid with horizontal cornices and vertical pilasters. In the long oblong panels these architectural features create are the relief sculptures. The representations in these panels are scenes from the scared texts including popular depictions of the Last Judgement, or Doom Day, as well as scenes from medieval folk law moral fables. The Romanesque sculptures of San Pietro extra moenia are restrained compared to the far more flamboyant Gothic style that replaced it. The simplicity of design of the facade is sophisticated and restrained and its messages are considered and well targeted. As typical of the Medieval period the scenes depict violent assaults upon men. The Last Judgement scene depicts devils dismembering sinners with their legs sticking out of a cooking children. Lions are represented evil on the relief panels of San Pietro they are depicted attacking men. According to the Medieval Bestiary Lionesses represent the sin of Pride hence the saying of the period “You have caught me because of my pride, like a lioness”. It was believed that Lions would only attack men, never women or children. The scenes depict men facing their own pride in the form of a Lion and being harried by the Lions “lest in security our minds become presumptuous and puffed up with pride”. Depictions of the Archangel Michael Killing the dragon and a deer killing a snake point to good winning over evil. The facade of the San Pietro extra moenia is a fine example of Italian Romanesque and has survived in remarkably good order. 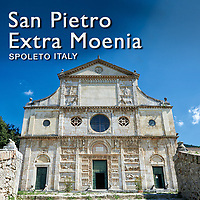 Buy pictures of the Romanesque facade of San Pietro extra moenia Church, Spoleto as stock photos or as photo art wall prints on line.